When it comes to greatness are you born with the special and extraordinary skills to make these achievements or are they self-made through hard work and unrelenting desire? In Peyton Manning’s case his greatness may come from both. When he was born, Peyton’s father had just completed his fifth season of professional football with the New Orleans Saints. Archie would go on to play eight more years in the National Football League. On Saturdays before Saint home games, Peyton and his brothers, Cooper and Eli, would attend practice with his father. “I wasn’t trying to expose them to football. I was just trying to spend time with my kids.” said Archie. Born with a cleft palate, he had to be feed with special bottles as an infant. He also had to undergo several surgeries, bone fusions and had to wear dental braces as a youngster. Due to his speech, he was teased and bullied. Peyton did not begin playing organized football until the seventh grade, and many speculated that Peyton’s abilities were inherited. “He was always pretty natural at throwing the football,” recalled his father. His older brother Cooper may have had as much influence on Peyton as his father. Two years older, Cooper was a high school teammate. He was an All-State receiver in high school, and like Archie was recruited to play at the University of Mississippi. While playing together the two were a formidable passing combination. “We had been throwing to one another long enough that we knew what one meant and what the other did,” said Cooper. During the summer before his freshman year at Ole Miss, numbness in Cooper’s fingers and toes sent him to the Mayo Clinic for evaluation. There it was discovered that Cooper had spinal stenosis, a narrowing of the spine. Doctors determined that another hit could mean paralysis. Cooper’s collegiate playing days were over. He then wrote his younger brother an inspirational letter. “I would like to live my dream of playing football through you. Although I cannot play anymore, I know I can still get the same feeling out of watching my little brother do what he does best. I know that we are good for each other, because I need you to be serious and look at things from a different perspective. 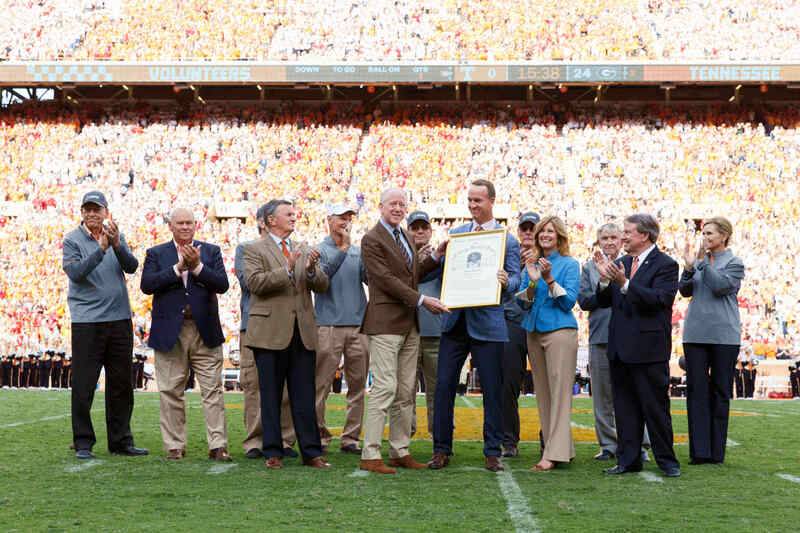 When Peyton missed the 2011 season due to a neck injury, it was Cooper who became his spokesperson through the three surgeries over a 19-month period.